Studio Line: Disney - Adventures this big don't grow on trees. Take a bite out of Disney's delicious Special Edition of James And The Giant Peach, and celebrate the 40th Anniversary of the popular children's book by Roald Dahl that inspired this imaginative film. This amazing mix of live-action, stop-motion-animation and computer-generated special effects includes Bonus Materials never before available. When young James spills some magic crocodile tongues, a giant peach grows as huge as a house. Climbing inside, he embarks on a thrilling and magical odyssey that only the creative team from Tim Burton's The Nightmare Before Christmas could bring you. Along the way you'll discover the famous star voices of Oscar winners Richard Dreyfuss and Susan Sarandon, Jane Leeves (Frasier) and Simon Callow (Shakespeare In Love) - plus the inspired music of Randy Newman. Enjoy -- it's a peach of a journey! Academy Awards: Nominated for Best Original Score-Randy Newman, 1997. DVD: Widescreen 1.66:1; audio English DD & DTS 5.1, Spanish & French Digital Stereo; subtitles none; closed-captioned; single sided - dual layered; 20 chapters; rated PG; 79 min. ; $29.99; street date 10/3/00. Supplements: Behind-the-Scenes Look at the Making of the Film; Still Frame Gallery of Concept Art and Puppet Designs; "Good News" Music Video Performed by Randy Newman; riginal Theatrical Trailer. Pity poor James Henry Trotter. The little fellow has spent his life overshadowed by his better-known big brothers, and if we don't help him soon, he's likely to develop a serious inferiority complex. As a novel, James and the Giant Peach certainly found a substantial audience, but it seems doomed to always be regarded as that "other" book from Roald Dahl. The story in question - Charlie and the Chocolate Factory, which appeared in movie form as Willy Wonka & the Chocolate Factory - has long maintained its status as a children's classic, whereas James is simply popular. At least the book version of James is overshadowed by only one other work; unfortunately for our little friend, the movie adaptation has to compete with two different pieces. Not only does Willy Wonka remain much better known than 1996's film version of James, but the latter also is less well-regarded than 1993's The Nightmare Before Christmas. In case the connection between James and Nightmare doesn't seem clear, it stems from the genre in which they exist. Both films use stop-motion animation, and they also were directed by Henry Selick. Although Nightmare wasn't a huge hit, it definitely achieved much greater successful than James, which quickly entered and departed the theatrical scene and which also didn't do much business on video, even though it had the marketing might of Disney behind it. Ignored and overshadowed though it may be, James is actually a pretty solid little film. It can be somewhat off-putting, however, as the story fluctuates between fantasy and reality with little indication in which world we reside. Part of me feels like James is supposed to be a Wizard of Oz-style dream. After all, when James goes into the more fantastic parts of his adventure, we see a slew of characters he encountered through more natural means, such as the spider he rescued from his aunts. However, I never saw any real indication that any parts of James were intended as sheer imagination on the part of the protagonist. Maybe I'm just dense, but I got the impression we were supposed to accept this bizarre world and all of its strange magic as a whole and not question any of the oddness, just as we did the same in Willy Wonka. The latter was more clearly grounded in reality, though; while some unrealism occurred, most of the movie stuck to a moderately realistic planet. James, on the other hand, combines cartoony but still frightful examples of child abuse with complete fantasy. Perhaps improbably, the film usually makes this mix work, though the early scenes seem uninteresting for the most part. James starts with live-action photography and switches to stop-motion animation part of the way through the film; the transition is handled marvelously as we see James turn into an animated character before our eyes. While the live-action segments are clearly necessary to set up the rest of the film, that doesn't make them enjoyable, and the gruesome nature of James' nasty aunts Spiker (Joanna Lumley) and Sponge (Miriam Margolyes) makes these scenes even less palatable. Once James becomes an animated kid and begins to interact with the anthromorphized insects, the movie becomes much more pleasurable and delightful. Much of the credit for the success of these segments goes to the animators, of course, as James provides consistently excellent examples of the art form. I've always been amazed at the work done by stop-motion animators; it seems like such a difficult and patience-taxing technique that I don't know how anyone can stand to do it! I'm happy they persevere, however, as the results are truly magical at times. I love all forms of animation and think each of them has its merits, but there's something special about stop-motion that makes it appear especially exciting and wonderful to me. We also encounter some consistently wonderful voice work in James. The film boasts a quite notable cast, with Academy Award winners Susan Sarandon and Richard Dreyfuss in the mix, plus Jane Leeves, Simon Callow, David Thewlis, and Margolyes (again). Each adds a distinctive tone to their characters and makes the movie more special. I was especially partial to Dreyfuss' interpretation of the New York streetwise centipede; he creates a character that stands out nicely amongst the others and becomes genuinely witty and endearing. I must admit I feel a little less enthusiastic about Paul Terry's performance as James. He handles the live-action shots and also does the voice during the animation, and he lacks much polish or realistic style. A lot of his work appeared forced and awkward and he couldn't provide much depth for the role. However, I generally felt positively about Terry just because he created a nicely exuberant tone for James. What he lacks in polish he makes up for through his innocent earnestness. Terry isn't a clear winner as James, but he does more right than wrong. My only major quibble with James relates to the film's music. Randy Newman has proved himself to be a solid songwriter, and he did excellent and memorable work with the score and tunes for Toy Story, which appeared only a few months prior to the release of James. However, this movie's songs are rather drab and lifeless, and they seem surprisingly basic and simple. These feel like the work of a clueless hack, not someone as accomplished as Newman. There's some charm in the simplicity, but I still think they seem like tunes that were dashed off in a real hurry; if "My Name Is James" took Newman more than ten minutes to write, I'll eat a bug. Ultimately, James and the Giant Peach isn't a classic animated film. It's not as good as close-cousin The Nightmare Before Christmas, but it seems endearing and entertaining nonetheless. The movie benefits from fine stop-motion animation, a clever and intriguing story, and some solid voice acting. Fans of animated movies will definitely want to take a look at James. 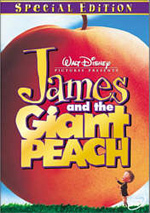 James and the Giant Peach appears in an aspect ratio of approximately 1.66:1 on this single-sided, double-layered DVD; the image has not been enhanced for 16X9 televisions. Though not totally flawless, the movie presented a generally terrific picture that almost always felt very satisfying. Sharpness appeared immaculate at all times. I noted not the slightest hint of soft or fuzzy images, and the movie seemed clear, crisp and well-defined from start to finish. Unsurprisingly, the stop-motion segments provided the greatest definition, since they can be photographed more precisely, but none of the live-action scenes appeared vague or hazy either. Moir� effects and jagged edges presented nearly no concerns. The print displayed almost no flaws. Some light grain appeared at times; this usually was found in the live-action shots, but a few animated sequences showed some grain as well. Otherwise I detected no concerns; I saw no signs of scratches, hairs, grit, speckles, tears or blotches. The movie's palette varied depending on the locale. During the live-action shots, the images remained exceedingly bland and gray, with very few instances of colors, but the situation became much brighter and cheerier in the stop-motion scenes; on those occasions, we witnessed a lovely array of hues that seemed accurate and rich. From the bold orange of the peach to the solid blue of the sea, almost all colors were reproduced with clarity and depth. In the movie's final sequence, I noticed some haziness to red lighting that illuminates live-action James, but this was not a major concern, and it was the only problem of any sort I attached to the film's colors. Black levels appeared equally terrific. Dark tones were thick and deep and I witnessed excellent contrast throughout the movie. Shadow detail seemed appropriately opaque but it lacked any signs of excessive heaviness. All in all, I found the image of James and the Giant Peach to seem very strong and pleasing. Time for one of my least favorite activities: the old Dolby Digital/DTS comparison! As I noted in my review of American Beauty, "DD vs. DTS" remains one of the most heated subjects on Internet newsgroups and forums. It almost becomes a religious debate at times, and neither side of the argument seems willing to give an inch. As such, the opinions of folks like me are often inveighed as "proof" that one format is better than the other, and I have to weigh my impressions even more carefully than usual; this means I only down one bottle of Jack Daniels while I watch the DVD instead of the customary three. To date, I think each of my DD/DTS comparisons has ended in either a draw or a victory for DTS. Those triumphs are usually small, though a few - such as American Beauty and Jaws - were more significant. As such, I believe this is the first time I'll write these words: on this DVD, I preferred the Dolby Digital 5.1 soundtrack to the DTS 5.1 mix. As you may have noticed, I didn't even bother to award separate grades for the two soundtracks. Although differences existed, they were minor enough for me to feel that each mix deserved an "A-"; the DTS track may be slightly weaker than the DD edition, but the reduction in quality was not strong enough to merit a full letter-grade drop. Here are the aspects both tracks share. The soundfields seemed reasonably broad and engaging, and they provided especially lively usage of the forward channels. These speakers offered a lot of action and placed the audio precisely within the spectrum, with some well-localized distribution of speech. The surrounds appeared somewhat modest during much of the film, but they contributed some strong effects on occasion and could add a nice punch to the picture when appropriate. I discerned no differences between the breadth or involvement communicated through either the DD or DTS soundtrack. Audio quality seemed quite similar as well, though it's here that I detected some differences. Dialogue appeared consistently natural and distinct, with no signs of edginess or problems related to intelligibility. The speech also blended well with the action and didn't stand out as dubbed (though it was done that way). Although Newman's songs aren't very good, they sounded fine, with fairly clear highs and adequately rich lows. Effects are generally crisp and clear, and they also displayed decent bass, though I felt the low end appeared less deep than I'd like; the bass often felt as though it came more from the mid-range than from the low end. At times, I detected slightly harsh and edgy qualities to the highs heard on this DVD, and surprisingly, these were exacerbated on the DTS track. I found that the DD mix provided slightly greater clarity and a less shrill quality than I witnessed on the DTS version, and the bass seemed a little better defined as well. Both tracks are solid and the differences are minor, but chalk this one up as a modest victory for the Dolby Digital mix. James and the Giant Peach doesn't offer a slew of supplemental materials, but we do find a few decent components. However, these seem awfully skimpy for a DVD that touts itself as a "special edition". First up is a "Production Featurette" that runs a whopping four and a half minutes. As one would expect from such a modest piece, this program is quite superficial and offers no depth or detail. However, it packs in a fair amount of information during its brief running time and I found it to provide a moderately entertaining experience. Next we find a music video for Randy Newman's performance of "Good News". This two minute and 20 second clip intermixes film snippets with shots of Newman as he sings the song in the recording studio. We also see a few seconds of production footage at the very start of the video, but none of this can be found later in the clip. Does this video sound dull? There's a reason for that: it is. In the "Still Frame Gallery", we get 72 images that are grouped into four different areas: "Puppets", "Concept Art", "Behind the Scenes" and "Live Action". Each section offers between nine and 36 stills, and these were all moderately interesting shots. We see the design drawings for the characters, plus the stop-motion puppets themselves plus shots from both the live-action and stop-motion sets. The pictures are generally compelling and deserve a look. The best part of the "Still Frame Gallery" comes from its interface, however. The vast majority of these sections present the pictures one frame at a time, which can make it extremely awkward and tedious to skip to a desired image; if the area has 200 frames and you want to see number 197, you'd best prepare to do some serious clicking. For James, however, the producers of the DVD have taken a more logical approach. Each screen includes thumbnails of nine images, and all you have to do is click on the desired picture. This makes navigation through the stills much more logical and easier, and I greatly appreciated its use here. Finally, the DVD features theatrical trailers for both James and Nightmare. I noticed that the former used Danny Elfman's musical cues from the latter, which doesn't really support my belief that Randy Newman knocked out his score during one lazy afternoon, but it doesn't shoot down my belief either. And yes, James includes Disney's notorious "forced" trailers. We find previews for Toy Story 2 and Lady and the Tramp II: Scamp's Adventure that appear prior to your arrival at the DVD's main menu. If one wants to skip these, this is easily done either by pressing the "skip" button on your remote or just through the use of the "menu" button. James and the Giant Peach remains a minor piece of Disney animation, though it stands out as one of only two stop-motion animated films sponsored by the studio, and it's also a pretty good little movie. I prefer big brother The Nightmare Before Christmas, but James certainly offers its fair share of charm and entertainment. The DVD provides very strong picture and sound plus a few passably interesting extras. James and the Giant Peach would make a nice addition to the collections of fans of Disney animation.